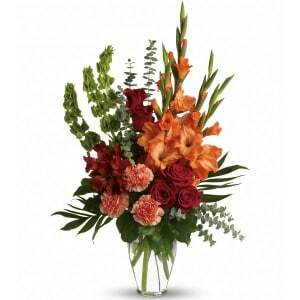 This warm and comforting vase arrangement will help bring sunshine to the hearts of those who have lost someone dear. 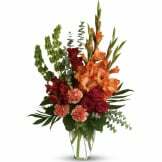 • This exquisite bouquet includes red roses, red alstroemeria, orange gladioli, orange carnations, bells of Ireland, emerald palm, salal, and spiral eucalyptus. 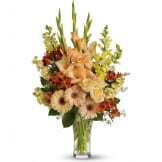 • Delivered directly to the funeral service, church, or family residence. 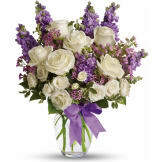 Flowers will be received by a Bryant Mortuary's staff. 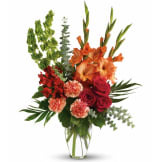 The great thing about the Sympathy Store is that I could order the day before the funeral and the flowers were delivered in time for the service. I was told it was a beautiful arrangement. I was very disappointed with the arrangement. The glads were not bloomed it looked like the roses had stalks coming out of them. I may not have been so disappointed if it was for someones birthday but for a funeral I would have rather had flowers that were blooming. All of our flowers are designed and delivered by hand from a local florist in in San Francisco.